Interesting Facts about Tornadoes !!! | Do You Know? Interesting Facts about Tornadoes !!! 1. Every tornado has its own color, sound and shape. 2. In 1928, a tornado in Kansas plucked the feathers right off some chickens.In 1931 a tornado in Mississippi lifted an 83 ton train and tossed it 80 feet from the track. 3. The wind speed of a tornado is recorded between 40 mph to 110 mph. These rotating tornadoes can travel many kilometers that cause severe destruction to mankind. 4. One cannot say a tornado is of a particular color. Their colors depend upon the environment where it occurs. When the surrounding areas are dry, a tornado may appear partly invisible. It may appear dark to the observer if the sun is behind the tornado. 5. Tornadoes can occur anytime of the year. The most likely time for them to form however is in the springtime in the plains and southern states. 6. Though tornadoes can and do form anywhere in the world, the United States, specifically Tornado Alley, get the most tornadoes out of anywhere in the world because unstable weather conditions are commonly found in this area. 7. Nebraska, South Dakota, Oklahoma, Texas and Kansas make up Tornado alley, where tornadoes strike regularly in the spring and early summer. 8. 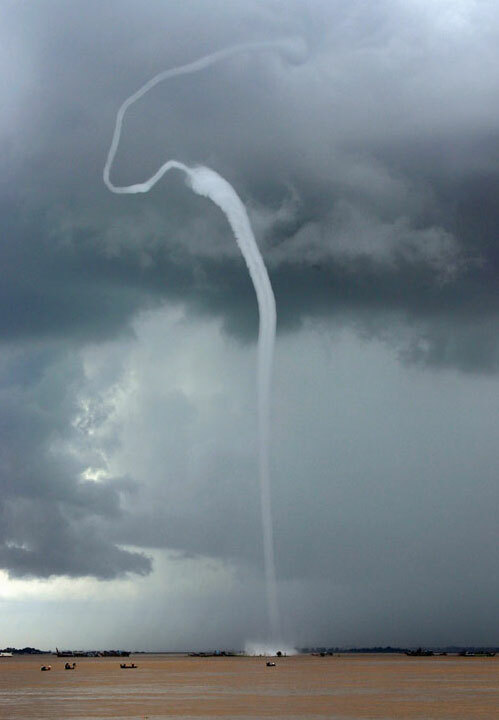 Waterspouts are tornadoes that form over a body of water. 9. Thunderstorms most likely to give birth to Tornadoes which are called supercells. 10. Some tornadoes make a considerable amount of noise while others make very little. It depends on the objects a tornado might hit or carry. 11. 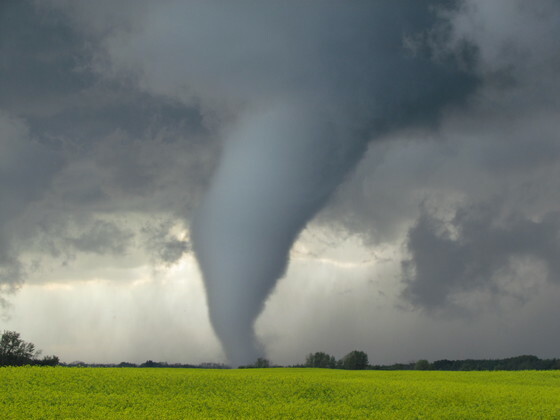 The term, tornado family, refers to many tornadoes. This happens when a storm creates more than one tornado. Such an occurrence can cause the creation of many tornadoes simultaneously in a particular area. 12. Tornadoes can occur at anytime, but they mostly occur between the hours of 3pm and 9pm. 14. There is no specific size of a tornado. They can occur in any size! 15. Each year, about a thousand tornadoes touch down in the United States, far more than any other country. 16. Some people have seen inside a tornado with their own eyes lived to tell about it. 17. Knives and forks have been found embedded in tree trunks flung from a tornado. 18. A Tornado can sometimes hop along its path. It can destroy one house and leave the house next door untouched. 19. 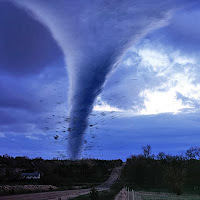 Tornado winds are the fastest winds on Earth. 20. 3 out of every 4 tornadoes in the world happen in the United States.